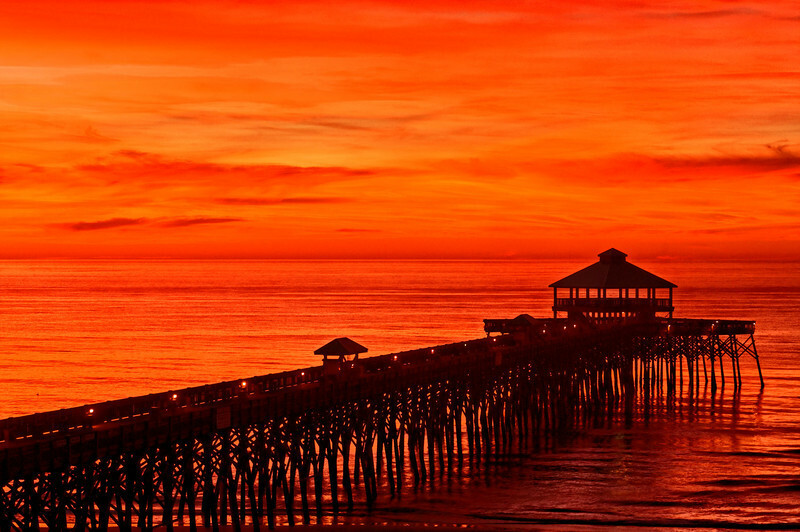 Folly Beach is located, appropriately, on Folly Island, just south of Charleston. The city has a population of 2,675 as of 2011. However, the population swells during the summer as tourists and Charleston's residents flock to the area. Our daughter and son-in-law live on Folly Beach, and this gallery is a collection of my favorite pictures from the last few years. Folly Beach is unusual in that it has the air of a beach from a much earlier time. There are no fast-food chain restaurants on the island, but there are a number of good restaurants and shops there. The only tall building is the nine-story Tides Motel, a former Holiday Inn. Sandwiched between multi-million dollar homes, you may find a "shack" dating from the 1950s or 1960s. The residents ride bicycles and golf carts everywhere. There is a laid-back, devil-may-care attitude that is reflected in the eclectic, colorful downtown buildings. After all, it is Folly. Nearby Morris Island is uninhabited. The Morris Island Lighthouse, no longer active, stands surrounded by the Atlantic Ocean due to either the rising ocean or the eroding beach. Take your pick. History suggests that the first "unofficial" shots of the Civil War were fired from the Cummings Point Battery on Morris Island on January 9, 1861. Confederates there fired on an unarmed merchant ship, the Star of the West, which was attempting to enter Charleston Harbor to resupply the Federal troops at Fort Sumter. The official first shot was not fired until April 12, 1861. There are several pictures here from the McLeod Plantation, which is located on Folly Road near the intersection with the Maybank Highway. The property dates from 1671 when William Morris of Virginia purchased it. In 1851, William Wallace McLeod bought the property. He built the house that stands today in 1856. During the Civil War, it served as a Confederate Divisional Hospital. There were 26, 20' by 12' slave quarters on the property, five of which remain. The Charleston County Parks and Recreation Commission purchased the property for $3.3 million in early 2011. It plans to restore the property and open it to the public. As of June 2013, the property is off limits to the public. For further information see http://south-carolina-plantations.com/charleston/mcleod.html or http://www.ccprc.com. Hope you enjoy this quick visit to Folly Beach!